If you ever had a goal in life you’d love to accomplish… but it seemed too difficult, well then the information I’m about to share is really going to help you. In fact, it might just change your life. Because I’m about to reveal the secret to achieving any goal you set your heart on. It doesn’t matter if the goal is simple… or complicated. It doesn’t matter if you’re close to getting there… or a long way off. It begins by taking that crucial first step. Before you can achieve your goals, you first need to decide what those goals really are. But you’d be surprised how easy it is to mess up. I’m talking about really giving your goal the thought it deserves… really focusing on it. You want to lose weight? How much? Do you want to lose ten pounds? Twenty? Thirty? When do you want to lose that weight? A month? Two months? Why do you want to lose that weight? Is it to look good in your wedding pictures? Is it to feel confident at the beach? These things are important… because once you’re able to visualize your goals… once you give meaning to them… once you start to feel how much achieving those goals will improve your life… then and only then will you be ready to make the changes necessary to reach those goals. Yes… you’re going to have to make changes. But this isn’t something to be afraid of. It isn’t something you should be discouraged by. It should be something you’re excited about. Yet most people sabotage themselves. They set themselves up to fail. Because they don’t set specific goals, it seems like they’re always further away from success than they actually are. If you set a goal to “get skinny”, what happens? You know that getting skinny requires healthy eating habits. You know it requires exercise. Things you haven’t been doing… so when you introduce those ideas to your mind, it rejects them. And you start to dread your new life before you even live it. And while you may be able to tough it out for a little while, eventually it becomes too exhausting. It’s too drastic of a change and you want to quit and go back to your old ways. Because the problem is, you viewed the changes as permanent… and that’s the wrong way to go about it. You never had the end in sight. 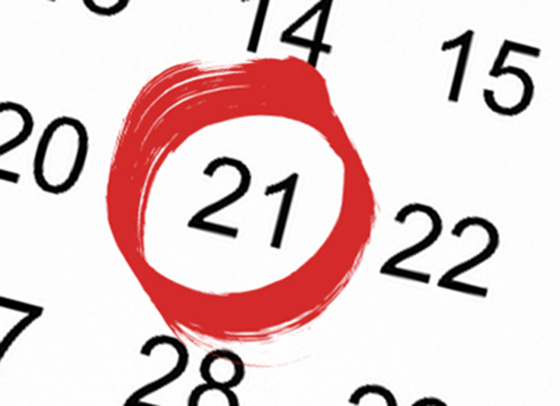 It takes 21 days for your brain to accept that new habit. for 21 straight days, it becomes a part of you. It becomes something you do automatically without even having to think about it. When most people start a new diet… they’ll keep it up for a week or two. Because they think they have to keep it up forever, they get discouraged and want to quit. But if they were able to keep it going just a little longer… by the 21st day… their new habits would no longer feel like something they’re suffering through. After 21 days of eating healthy, that would become their new normal. That would be what they’re used to. So those new habits would be easy to keep up with! Don’t commit to eating healthy for the rest of your life. That’s too hard to accept. And make sure to keep it up for 21 days. I promise you, you’ll be shocked at how much of a difference it makes. And it becomes easier and easier to keep up with the habits. During my 21 day commitment to change, I dropped 14 pounds of fat! It wasn’t coincidence. It wasn’t by luck. It was because I developed a system for making fat loss simple, quick… and FUN! And once people saw my shocking transformation, they begged me for the secrets of making it happen. So I shared that system with my health coaching clients. The system I used to drop 55 pounds of fat…* and keep it off for good. That video is free… and you can watch it right now by clicking here! And when you apply the secrets in the video… you’ll find that achieving your fat loss goals can happen automatically… without you even having to think about it. Because you’ll learn how to build that crucial Mind Body Momentum you need to create a habit. So make sure to watch that video. It will help you achieve your goals. And if you know anyone else struggling with their goals, be a good friend and show it to them. You can help change their life as well. And as always, if you have any questions or concerns, leave me a comment in the section below.